With just the climb of the Croce d?Aune to test Campagnolo?s latest groupset over, this is one of the briefest First Rides we?ve had, but it?s more than sufficient for the purpose of getting a feel for the pre-production Super Record. Campagnolo has completely revised it?s range of groupsets for 2009, and the details are on pages 10-13, so we?ll avoid going over the same ground, assume you?ve read that and jump straight into the performance of the new Super Record. If you want to know more of the technical specification changes then we’ve outlined them in a separate article. From the off, you?ll notice that the hoods have been lengthened, extending around a centimetre more from the bars than the previous 10-speed versions, and the body of the hood integrates with the top of the bar better. This combination feels just a little odd at first. Yet, within a few minutes, providing you have corrected for the additional length, it?s all very comfortable and the improvements are a definite hit. The hoods are also broader and softer, but this is much less noticeable than the other changes ? they are probably something you?ll enjoy more the longer your ride goes on. With 30 bikes to set up, it?s hardly a surprise that mine wasn?t shifting perfectly as we headed off en mass to tackle Tullio Campagnolo?s ?light bulb moment? climb. Having a moment of my own, I couldn?t at first understand why my minor adjustment, made in an attempt to fine-tune the gears, had such a dramatic overcorrecting effect. 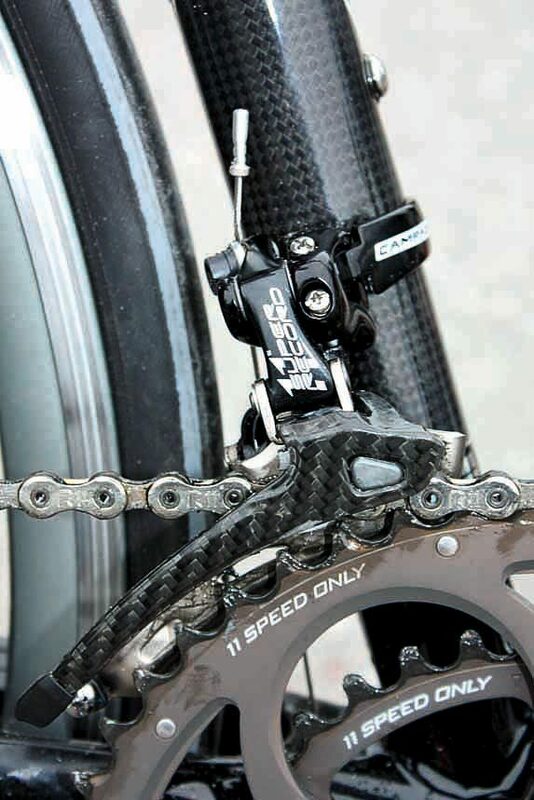 Having double-checked with the engineers regarding the pull ratio, which remains unchanged at 1:2, the additional sensitivity of the gears can only be put down to the smaller tolerances used throughout the groupset, with even the cables being updated along with shift mechanism and new torsionally stiffer parallelogram rear mech. 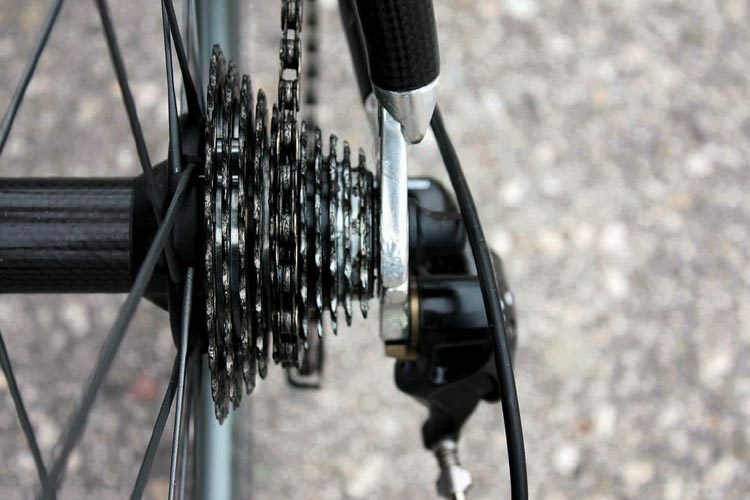 When all the improvements combine they bring significant benefits, as the shift feels far sharper and more positive than the already excellent 10-speed Record.Thanks to the new internals the shift is no heavier, but amplifies the quality and accuracy of the shift feel ? a seriously positive forward step. If there was one thing to pick upon with this pre-production shifter, it was that the downshift lever, or thumb button, was somewhat slow to return. This could easily have been due to the hood seal, and we?d certainly expect it to be resolved before production. On the slightly undulating Croce d?Aune a few front mech shifts were possible, and here again the improvement was marked. The take-up of the cable is much more rapid and feels like the step that should have been made last year when Quick Shift was introduced. Only time will tell if the performance dulls, but even if something is lost it?s still the best shifting performance Campagnolo has ever produced. The micro adjust of the front mech has been continued, and when added to the slight funnel shape of the mech, the full spread of 11 gears is accessible from both front rings ? without rubbing. With the Skeleton brake design remaining, but the lever profile changing, it?s reassuring that the performance is every bit as good as previous versions. Given the advances talked about with the new carbon wheel-specific brake pad compound, it?ll be exciting to see how big a step forward Campagnolo has made. 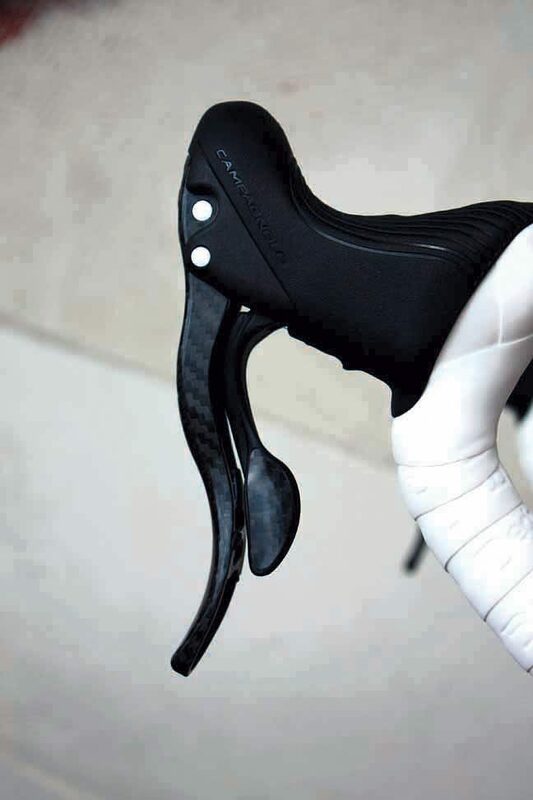 Campagnolo has really come up with the goods. Every aspect of the Super Record is worthy of the adjective bolted to the front of its name. Campag fans can rejoice, and their bank managers can rub their hands in glee ? the Super Record is absolutely awesome. We expect the Chorus and Record to be every bit as good too.